Flirt with your best friend’s girl, and today you might get an angry text message or the cold shoulder. But in John Cranko‘s ballet “Onegin,” your coquettish ways could mean death by handkerchief. Alexander Pushkin’s heavy-themed poem “Eugene Onegin,” written in the early 1800s, wrestles with status, love, and remorse. And the ballet doesn’t deviate too far from the poem. 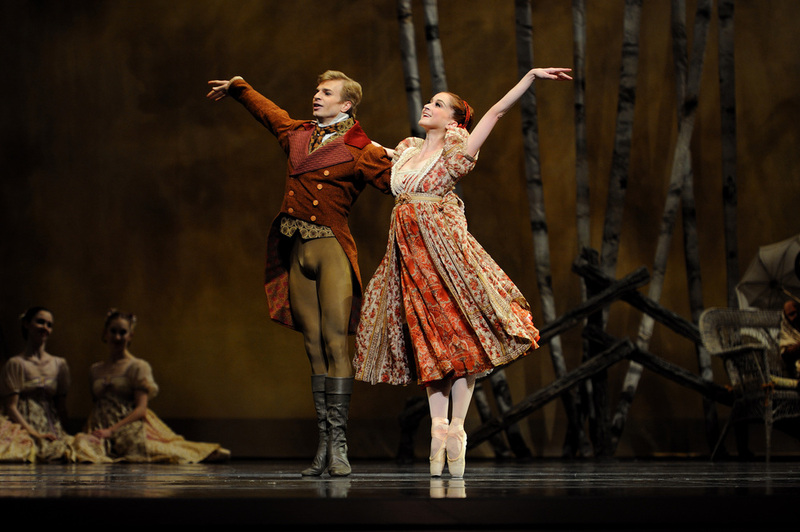 Cranko’s ballet follows an upper-crust man, Onegin, as he visits with his friend Lensky out in the Russian country. As Lensky spends some quality time with his bride-to-be, Olga, Olga’s younger sister Tatiana, a bookish innocent, falls head-over-heels for Onegin. Onegin spurs her advances, and later on, Tatiana puts off sleep to write him a long, impassioned love letter. But Onegin doesn’t have any desire towards Tatiana. Instead, he views her as a country girl not worthy of his time and charm (And by charm, I really mean “charm.” He dresses in fitted black suits, tans on a regular basis, and eludes a slight smarmy air mixed with a few drops of “If I raise my nose any higher, it shall be burned off by the sun.” Who wouldn’t want a piece of that?). Becoming bored, he flirts with Olga, which ticks off Lensky, (and rightly so). After many attempts at putting the kibosh in the canoodling, Lensky steps in, slamming his handkerchief down harder than any handkerchief has ever slammed before. Oh, it is SO on. Then there’s a pistol duel followed by a time machine jaunt (aka intermission #2) and years later, Tatiana is married to a distant cousin (hey, it’s all legal! ), and she and Onegin cross paths once again. Through an intense pas de deux, Tatiana wrestles with her feelings for Onegin, but finally tells him to get out of her life. He’s not the man she thought he once was. Toodaloo to you, Onegin. The story unfolds before us as the first scrim lifts high overhead to reveal the scene: behind another gorgeous scrim etched with writing, Olga and Tatiana are spending some time, albeit apart, outside at their country house amidst the tall birch trees. On opening night, Maria Kochetkova danced an inspired Tatiana, one that grew from a doe-eyed young girl with dreams of romance into a mature woman, all while experiencing a fever of emotions, great loss, and difficult personal choices. Kochetkova, while born from the great Russian ballet tradition, defies pigeonholing. She’s not simply a lyrical dancer or a classical dancer. Her craft moves beyond one genre and envelops them all into a tidal wave of utterly brilliant ingenuity. Watching her embody Tatiana and spit forth something so remarkable is a true honor. Her Onegin, Vitor Luiz, pulled off the guy-you-want-to-hate-but-somehow-still-pity convincingly, and he partnered Kochetkova with careful support and care, even while thrust into the dark depths of his character. Clara Blanco’s Olga sang of utter adorableness–her pirouettes and balances hung for ages, and she embodied her character like an eager beaver–and I’m thoroughly thrilled that upon the night’s close, Artistic Director Helgi Tomasson finally promoted her to soloist. It’s about time! Gennadi Nedvigin’s Lensky may be a bad picker of friends, but Nedvigin’s performance married his sure-footedness with a surprising gift of theatrical timing and character portrayal. The supporting cast and corps de ballet looked well trained, thanks to Reid Anderson and Jane Bourne’s articulate eye for coaching. And the San Francisco Ballet Orchestra moved steady and true through the underwhelming score, pieced together from various works by Tchaikovsky. “Onegin” tells the story of gut-wrenching is-it-or-isn’t-it love that collides with fate at the most inopportune of times. Cranko’s choreography is anything but dusty and dreary; it exudes a constant thinking stream, one filled with angst and broken desire. And as San Francisco Ballet bring the story to life, each member’s vivid movements sing of curved limbs, grasped shoulders, and sweeping steps, while the movement phrases serve a larger storytelling purpose. If you can score a ticket, consider yourself lucky. This production proves stellar.